Towards the end of his life Khachaturian wrote a series of works for solo string instruments, which formed his final musical legacy. The Sonata-Monologue for solo violin was his penultimate work, composed in 1975 for the gifted Kiev-born violinist Viktor Pikaizen, a pupil of David Oistrakh. Khachaturian may have been thinking of Pikaizen’s reputation as an exponent of the unaccompanied violin works of Paganini and J. S. Bach, which he had made very much his own in terms of repertoire. 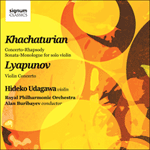 The term ‘monologue’ in the title is no conventional epithet: Khachaturian was clearly inspired by the idea of the violinist as a lonely, bardic voice, and the folkloric aspects of his style are accordingly in prominence once again. The implied image of the work is that of an Armenian ashug or itinerant bard and mystic who improvises songs: it is worth noting that two of Khachaturian’s earliest works were a piece entitled Roaming Ashug’s Song for cello and piano (1925) and a Song-Poem, In Honour of the Ashugs, for violin and piano (1929). The single-movement Sonata-Monologue juxtaposes voluble, rhapsodic outpourings in alternation with more obstinate rhythmic episodes where a single phrase may be explored through exhaustive repetition, but the overall effect is of something concentrated and controlled. The monologue character, like a keening or protesting vocalise, has a power and intensity offset dramatically by the forward drive of the more rhythmic sections. The music passes through a succession of emotional states, only to end in a questioning, unresolved coda, as if the lone figure of the bard, still singing, has passed on into the distance.